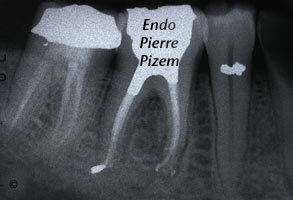 A 40 years old male patient presented for an emergency dental examination. 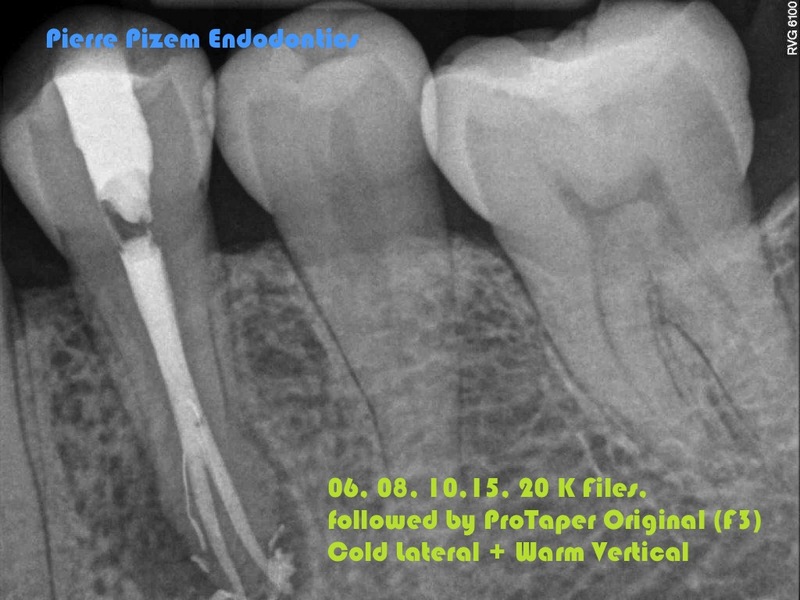 Clinical examination: gum swelling, broken filling, tooth tender to palpation and (gentle) pressure, tooth did not respond to thermal or electric sensitivity test, periodontal probing depth are wnl. 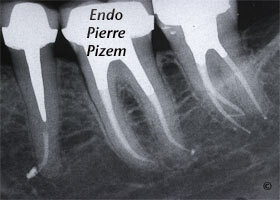 The diagnosis was acute periapical periodontitis associated with an infected necrotic pulp. 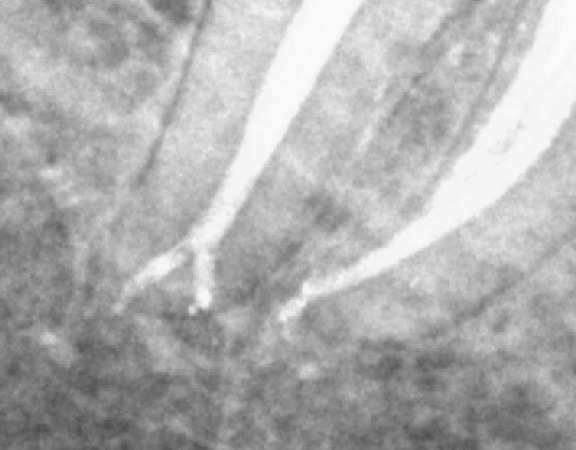 A very rare anatomical variation: A Vertucci’s type V configuration in distal root and mesio vestibular portal of exit oriented toward mesial. 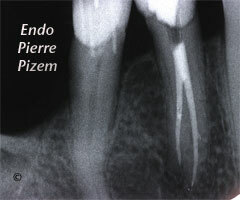 Engine driven files beware! 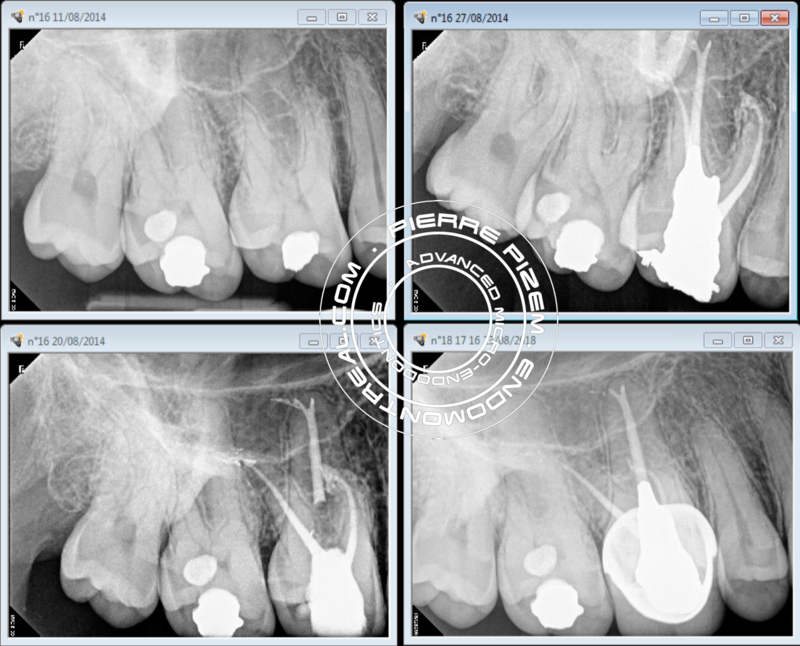 How the Use of Opmi PROergo Dental Operative Microscope Prevented an Unnecessary Molar Extraction. 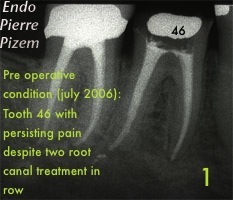 An Endodontist Case Study. 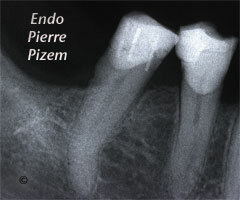 Two successive root canal procedure attemps failed on this mandibular molar. 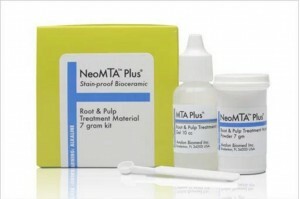 In the past three years patient had to take many courses of antibiotics to control pain and swelling. 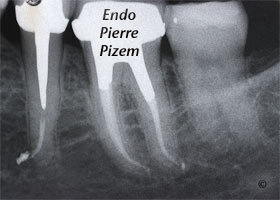 Patient is unable to chew on that tooth. 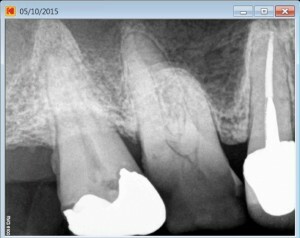 An extraction and an implant supported crown has been suggested but patient wants to keep his own tooth despite all this. Clinical examination shows vestibular swelling, probing does not show any narrow deep pocket. On radiographic examination filling material is overextended in distal root and a large bone rarefaction area is present on distal root tip. 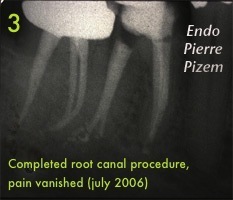 Retreatment of the root canal on distal root is suggested because an untreated fourth canal is suspected. 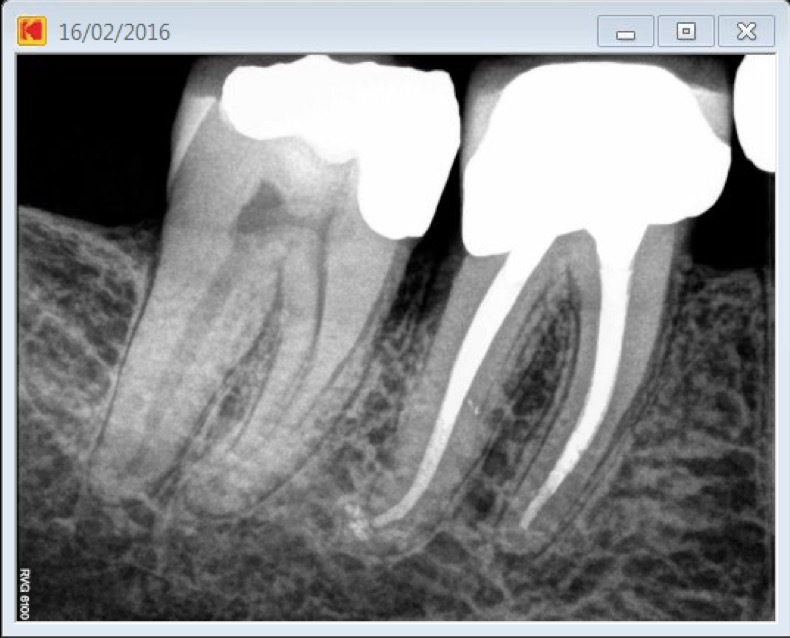 Once filling material has been removed no extra canal could be found, instead, with the help of high magnification an apical delta or Vertucci’s type V pulp space configuration could be noticed. 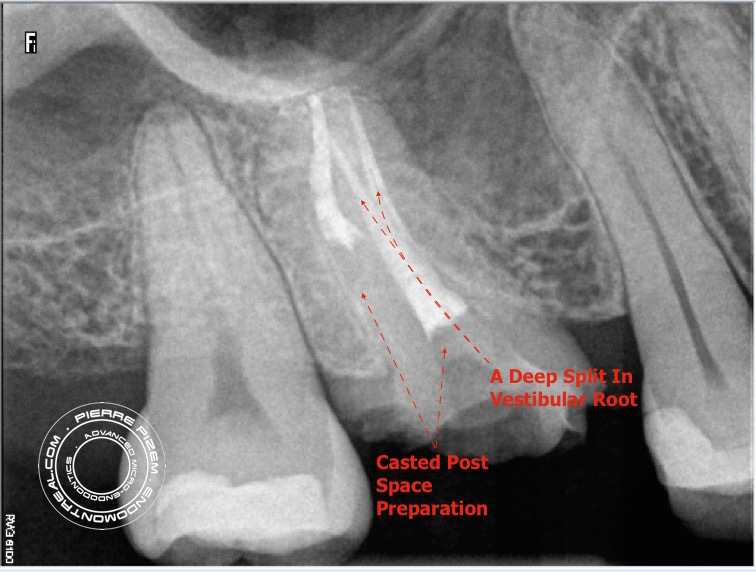 A Vertucci type V pulp space configuration can be described as follow: One canal leaves the pulp chamber and divides short of the apex into two separate distinct canals with distinct foramina (1-2). 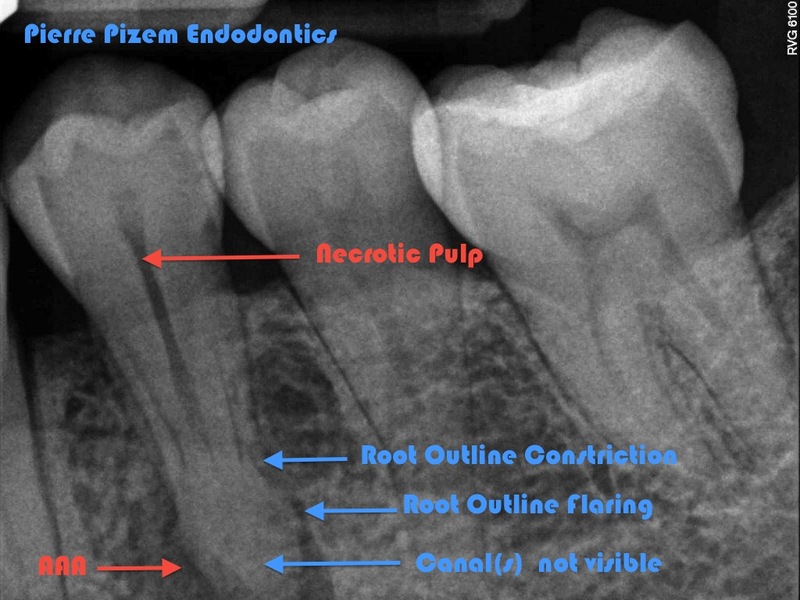 According to Vertucci’s study in 1984 on a 100 mandibular molars sample, the type V configuration in distal root, occurred only in 8% of the teeth examined. 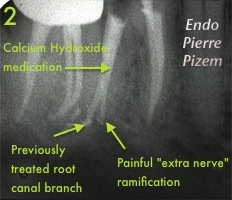 Consequently the untreated branch is filled with necrotic pulp and bacteria releasing toxins into the surrounding bone area. An ISO files number 08 is inserted into the untreated branch, then, a NiTi file is also inserted into the retreated branch through the same canal entry and a second Xray is taken. The second Xray clearly displays the apical split in last apical third of distal single canal. 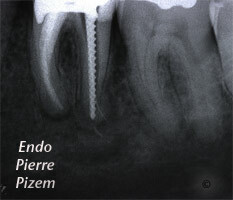 Each part of the split in distal root has been individually cleaned and shaped. NiTi files allowed us to follow both curved branches. 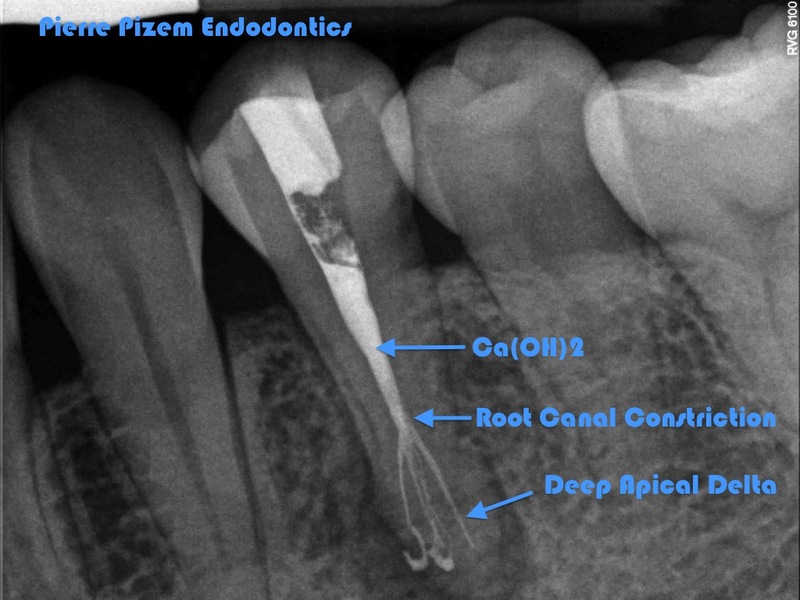 Root canals have been filled with calcium Hydroxide and patient came back 8 days later to have those filled with Pulp Canal Sealer and gutta percha. (Lateral and vertical condensation). 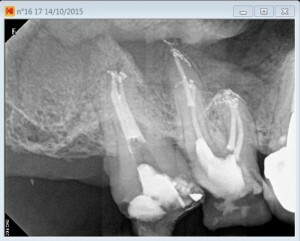 Last (Angulated) X ray to the right shows the two branches after final obturation. 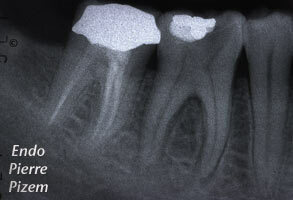 Tooth symptoms have subsided shortly after calcium hydroxide have been inserted into the root canal system. 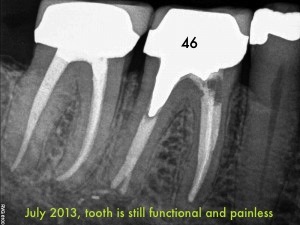 Two months have passed and tooth is still symptoms free. 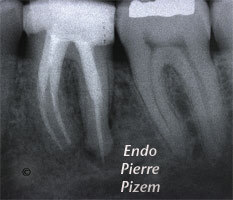 Being able to get magnification and bring illumination to the root canal tip allowed for that tooth to be preserved. Patient was told to protect his tooth with cusp coverage. Filed Under: Atypical canal configurations, Dental operating microscope (D.O.M.) assisted R.C.T., Type V, What's new? Carl Zeiss OPMI PROergo Insured Enough Visual Accuracy to Prevent a Missed Apical Split in a Calcified Mesial Root. 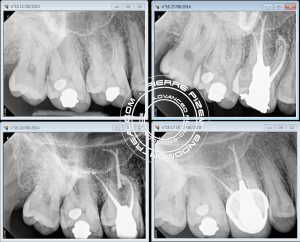 The recent addition of dental operative microscope (DOM) to endodontic therapy can allow better visualization and management of the intricate morphology of the root canal system during endodontic procedures through magnification and greatly improved high intensity lighting. 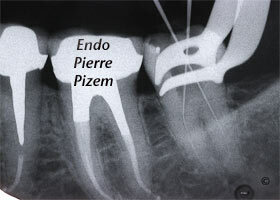 Dental Microscope typically magnifies in the 4X to 25X range. The other commonly used magnification aide, through lens eyeglass mounted surgical telescopes, provides 2.5X to 4.5X magnification. 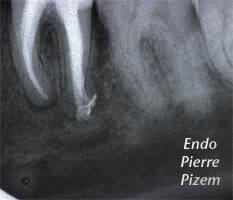 We have been presented with this second mandibular molar that has only two canal entries on pulpal chamber floor. At first sight one could have easily concluded the presence of only two canals. 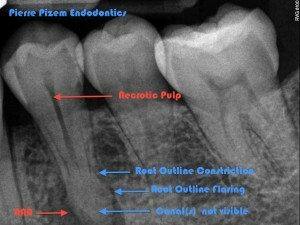 In fact, the mesial root has a Vertucci’s type 5 canal configuration. 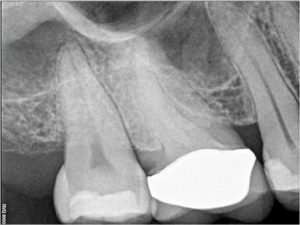 A Vertucci type V pulp space configuration can be described as follow: One canal leaves the pulp chamber and divides short of the apex into two separate distinct canals with two distinct foramina (1-2). 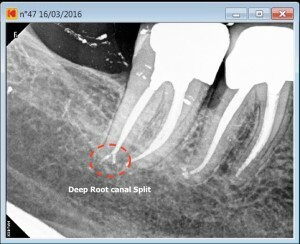 Without magnification the root canal apical “split” could have been under seen, treating one branch out of two and leaving pulp tissue inside the other branch. Surgical operating microscopes have a steep learning curve and require training, as well as patience and practice to master. 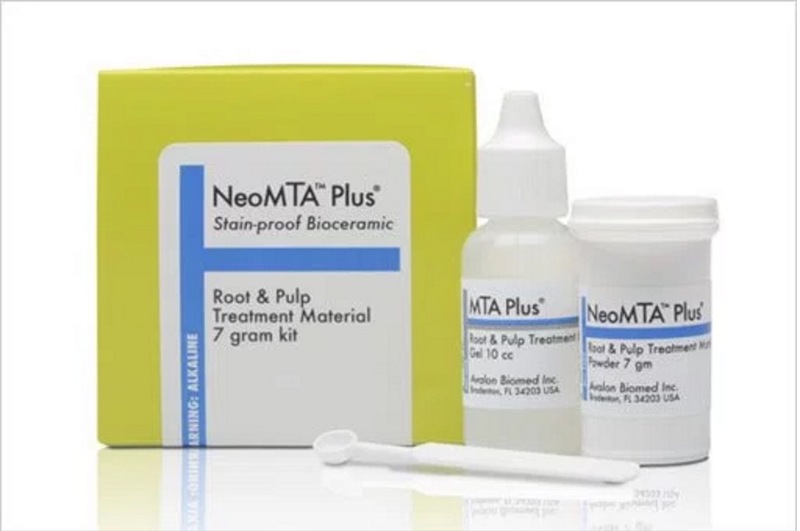 Still this piece of equipment and the learning effort it implies is well worth it since cases that once seemed impossible can now be treated with a high degree of confidence and clinical success. 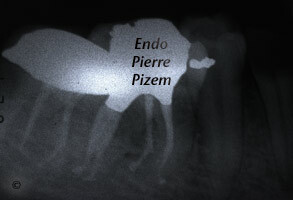 As the saying goes:”A picture is worth a thousand words”, Click here to have a look at what can be seen at an operative field under magnified observation (10X to 25X range).